Peter Brown and colleagues announced today the discovery of a new species of small-statured humans, Homo floresiensis. These humans were probably descended from populations of Homo erectus who were stuck in the island of Flores. Due to either thermoregulation (small people larger surface/volume), or a scarcity of food sources, there was selection pressure for smaller size. Other animal species on the island also underwent a similar dwarfing process. The Homo floresiensis people are surprising for an additional reason: their tools are more similar to those of Homo sapiens and unlike those of the much earlier and bigger-brained Homo erectus. No Homo sapiens has yet been found on the island, and it seems that these small humans, despite their small brain size (smaller than even adult chimpanzees!) were able to develop these tools. A new human-like species - a dwarfed relative who lived just 18,000 years ago in the company of pygmy elephants and giant lizards - has been discovered in Indonesia. 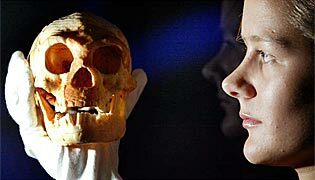 Skeletal remains show that the hominins, nicknamed 'hobbits' by some of their discoverers, were only one metre tall, had a brain one-third the size of that of modern humans, and lived on an isolated island long after Homo sapiens had migrated through the South Pacific region. Brown P., et al. Nature, 431. 1055 - 1061 (2004). Currently, it is widely accepted that only one hominin genus, Homo, was present in Pleistocene Asia, represented by two species, Homo erectus and Homo sapiens. Both species are characterized by greater brain size, increased body height and smaller teeth relative to Pliocene Australopithecus in Africa. Here we report the discovery, from the Late Pleistocene of Flores, Indonesia, of an adult hominin with stature and endocranial volume approximating 1 m and 380 cm3, respectively—equal to the smallest-known australopithecines. The combination of primitive and derived features assigns this hominin to a new species, Homo floresiensis. The most likely explanation for its existence on Flores is long-term isolation, with subsequent endemic dwarfing, of an ancestral H. erectus population. Importantly, H. floresiensis shows that the genus Homo is morphologically more varied and flexible in its adaptive responses than previously thought. Morwood M. J., et al. Nature, 431. 1087 - 1091(2004). M. J. MORWOOD et al. Excavations at Liang Bua, a large limestone cave on the island of Flores in eastern Indonesia, have yielded evidence for a population of tiny hominins, sufficiently distinct anatomically to be assigned to a new species, Homo floresiensis. The finds comprise the cranial and some post-cranial remains of one individual, as well as a premolar from another individual in older deposits. Here we describe their context, implications and the remaining archaeological uncertainties. Dating by radiocarbon (14C), luminescence, uranium-series and electron spin resonance (ESR) methods indicates that H. floresiensis existed from before 38,000 years ago (kyr) until at least 18 kyr. Associated deposits contain stone artefacts and animal remains, including Komodo dragon and an endemic, dwarfed species of Stegodon. H. floresiensis originated from an early dispersal of Homo erectus (including specimens referred to as Homo ergaster and Homo georgicus) that reached Flores, and then survived on this island refuge until relatively recently. It overlapped significantly in time with Homo sapiens in the region, but we do not know if or how the two species interacted. Australian scientists have found a new species of hobbit-sized humans who lived about 18,000 years ago on an Indonesian island. The discovery adds another piece to the complex puzzle of human evolution. The partial skeleton of Homo floresiensis, found in a cave on the island of Flores, is of an adult female that was a metre tall, had a chimpanzee-sized brain and was substantially different from modern humans. Researchers announced today that an excavation in Liang Bua cave on the Indonesian island of Flores has uncovered a new species of human, barely a meter tall, that lived as recently as 13,000 years ago. Christened Homo floresiensis, the hominid--known primarily from a partial skeleton known as LB1--had adult body and brain proportions comparable to those of the much older australopithecines, such as Lucy. Other features, however--including those related to chewing and walking--align it with our own genus, Homo. Describing the find in the October 28 Nature, Peter Brown of the University of New England in Armidale, Australia, and his colleagues surmise that H. floresiensis was a descendant of H. erectus. With H. sapiens arriving in eastern Asia by 35,000 years ago, and relic populations of H. erectus possibly persisting on nearby Java, three human species may have co-existed in this region not so long ago. Scientific American.com's editorial director, Kate Wong, spoke with Brown about the discovery. An abridged, edited transcript of their conversation follows. In this article, US and UK census data are used to compare the propensity for matches between blacks and native born whites in England and the US. Blacks are disaggregated into three ethnic groups: Black Caribbeans, Residual Blacks and, in the US, African Americans. The first group receives the most theoretical attention. Both raw percentages and parameters that control for several covariates – such as age, education and city of residence – are examined. The results indicate that, with or without controls and irrespective of ethnicity, blacks in Britain are significantly more likely to have a native born white partner than their US counterparts. These findings accord with assimilation theory, but the article's conclusion suggests that, in both countries, the assimilation of people of African descent operates differently from the assimilation of whites. Leoussi A. S.; Aberbach D.
This essay sketches the ambivalent relationship of Hebraism and Hellenism from ancient times to the foundation of modern Israel. It analyses classical Greek influence on the Jewish Enlightenment (the Haskalah) and modern Jewish nationalism, particularly as reflected in Hebrew literature. Greece's successful struggle for independence from Ottoman Turkey in the 1820s showed the early Zionists that an ancient nation could be resurrected. Also, the ancient Greek ideal of physical education, revived in nineteenth-century Europe, radically transformed both Christian and Jewish attitudes to the body, giving rise to two related movements, "muscular Christianity" and "muscular Judaism". As the assimilationist attempts of the Haskalah broke down in the late nineteenth century under the burden of anti-Semitism and European racial nationalism, "muscular Judaism" was incorporated into Zionism. Jewish nationalists largely rejected rabbinic spirituality, non-belligerence and the disdain for athleticism which had dominated Jewish life after Rome destroyed the Jewish state in 70 CE. Massimo Pigliucci and Jonathan Kaplan's paper  is an interesting retrospective of a much cited 1979 paper by Gould and Lewontin  which criticized the "adaptationist" program, namely the idea that every widely distributed trait must be an adaptation that has been favored by natural selection. Archaeologists working in the Peloponnesian city that organized the ancient Olympic Games have unearthed a 5,500-year-old cemetery expected to shed light on an obscure period of early Greek history, the Ministry of Culture said yesterday. The 25 graves, some of which contain over 10 burials, emerged during a rescue dig on the site of ancient Elis ahead of work to build a theater. 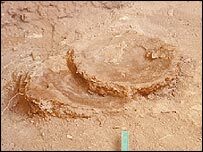 Dug into a knoll, the cemetery dates between the Final Neolithic and the Early Bronze Age (3500-2800 BC). Each grave was approached by a small cutting, much like later Mycenaean tombs. Offerings of pottery and jewelry accompanied the prehistoric Eleans in their journey to the other world. Germany's six largest immigrant groups, from Turkey, Italy, Greece, Spain, Poland and the former Yugoslavia, have large discrepancies with respect to economic and educational success. Whereas the Spanish assimilated in one generation, and the Polish group is about to repeat that pattern, the Greeks kept their distinctiveness. Both groups were largely successful, in contrast to the Italian immigrants who lag behind, as well as the Turkish group. The article discusses various explanations that have been given and focusses on the development of immigrants' social capital and network building as the major reason for success. Researchers deleted large portions of junk DNA from the mouse genome and created mice with the altered genome. No adverse effects were detected, indicating that perhaps non-coding DNA may in fact be useless. MARCELO A. NÓBREGA et al. The functional importance of the roughly 98% of mammalian genomes not corresponding to protein coding sequences remains largely undetermined1. Here we show that some large-scale deletions of the non-coding DNA referred to as gene deserts2-4 can be well tolerated by an organism. We deleted two large non-coding intervals, 1,511 kilobases and 845 kilobases in length, from the mouse genome. Viable mice homozygous for the deletions were generated and were indistinguishable from wild-type littermates with regard to morphology, reproductive fitness, growth, longevity and a variety of parameters assaying general homeostasis. Further detailed analysis of the expression of multiple genes bracketing the deletions revealed only minor expression differences in homozygous deletion and wild-type mice. Together, the two deleted segments harbour 1,243 non-coding sequences conserved between humans and rodents (more than 100 base pairs, 70% identity). Some of the deleted sequences might encode for functions unidentified in our screen; nonetheless, these studies further support the existence of potentially 'disposable DNA' in the genomes of mammals. An interesting article on cross-national occurrence of family violence in Europe. Please read the full article for more information on individual country cases. This article reviews current victim studies on family violence in Europe and attempts to interpret the variation in the prevalence rates. Methodological shortcomings contribute in part to different rates across countries. The prevalence rates are also linked to preventive and causative factors. Three factors appear to explain the differing prevalence rates in European countries: deprived economic living conditions, traditional attitudes toward women and children, and a general tolerance of violent behavior in a given society. In addition, personal coping may influence whether a family member will act violently against another family member. A new article by S.O.Y. Keita examines craniofacial variation in northeast African populations. Two points need to be made: first, the greater degree of morphological variation in the several African populations is expected due to their wider geographical dispersion, compared e.g., to the three European populations from Austria, Hungary and Norway. All of the African populations represented in this study, or related peoples, are either in the PN2 or YAP+ ‘‘family’’ at some substantial level. From a general evolutionary perspective, the PN2 clade trenchantly demonstrates the point that individuals/populations having a tremendous range of physical traits, the focus of traditional approaches, can have fairly recent common ancestry in terms of lineage, i.e., can derive substantively from a common population, and therefore, in this sense, be more related than they are to others to whom they may be more phenetically similar in craniometric pattern (or classical polymorphisms). Of course this argument for the alleged phenotypic plasticity of YAP+ Africans (almost all of which belong to haplogroup E) fails to account for the alternative explanation for their wide craniofacial variation, namely admixture. North Africans who belong to haplogroup E have very small occurrence of the archaic proto-human lineages A and B, and of matrilineages found in Sub-Saharan Africa. So, they are probably different from Negroids due to the fact that they're overall genetic makeup is different, even if they are linked by common ~30ky old Y-chromosomal lineage. A principal components analysis was carried out on male crania from the northeast quadrant of Africa and selected European and other African series. Individuals, not predefined groups, were the units of study, while nevertheless keeping group membership in evidence. The first principal component seems to largely capture size variation in crania from all of the regions. The same general morphometric trends were found to exist within the African and European crania, although there was some broad separation along a cline. Anatomically, the second principal component captures predominant trends denoting a broader to narrower nasal aperture combined with a similar shape change in the maxilla, an inverse relation between face-base lengths (projection) and base breadths, and a decrease in anterior base length relative to base breadth. The third principal component broadly describes trends within Africa and Europe: specifically, a change from a combination of a relatively narrower face and longer vault, to one of a wider face and shorter vault; it shows the northeast quadrant Africans along a cline with the other Africans. Stated in relative terms, the northeastern Africans tend to exhibit narrower bases in relationship to more projecting faces, and broader nasal areas than Europeans, although there is range of variation. Relative to the other African groups, they have narrower nasal areas and narrower faces in relationship to vault length. The crania from the northeast quadrant of Africa collectively demonstrate the greatest pattern of overlap with both Europeans and other Africans. Variation was found to be high in all series but greatest in the African material as a whole. Individuals from different geographical regions frequently plotted near each other, revealing aspects of variation at the level of individuals that is obscured by concentrating on the most distinctive facial traits once used to construct types. The high level of African interindividual variation in craniometric pattern is reminiscent of the great level of molecular diversity found in Africa. These results, coupled with those of Y chromosome studies, may help generate hypotheses concerning the length of time over which recent craniometric variation emerged in Africa. I have often witnessed a particular logical error, namely the inference of between-individual differences based on knowledge about between-group differences. Imagine for example two groups, A and B, and two numerical traits X and Y. Group A has an average value of X(A)=10 and an average value of Y(A)=20. Group B has an average value of X(B)=15 and an average value of Y(B)=30. You can add more groups, maintaining the property that a higher group value for X is associated with a higher group value for Y. Indeed, you might regress X(.) on Y(.) and find a strong positive correlation between the two: high X(.) value corresponds to high Y(.) value. The logical error is the following: to infer that this means that individuals with a high X value also tend to have a high Y value. To see why this is the case, suppose that group A has three individuals a, b, c with values X(a)=5, X(b)=10, X(c)=15 and Y(a)=30, Y(b)=20, Y(c)=10. It is easy to see that these values do in fact correspond to a group average of X(A)=10 and Y(A)=20, but it is obvious that within the group low X values are associated with high Y values and vice versa. The same situation might also be the case for group B, and it would thus turn out that when it comes to individuals low X values are associated with high Y values, that is the opposite correlation to that of the group averages. The lesson from this example is the following: whenever you hear that e.g., group A is "greener" than group B and group A is "smarter" than group B, therefore "greener" people are "smarter", you should ask to see the correlation between "green" and "smart" individuals and question the assumption that group-based differences have anything to do with individual difference. PS: I had meant to write something on the topic for a while, but I was reminded to do so by Steve Sailer's new article on John Kerry's IQ. Steve brings up a recent hoax which he uncovered regarding supposedly "smarter" Democratic-voting versus "dumber" Republic-voting states. Liberals were eager to treat this as evidence that liberals are smarter than conservatives. As the analysis above shows, this would emphatically not be the case, even if those results were correct. But, note also, that the fact that Democratic-leaning states vs. Republican-leaning states tend to have similar average IQs does not prove that Democrats and Republicans tend to have similar IQs, for exactly the same reason. It is quite possible that individual-based comparisons within each state and consequently within the total US population might indicate that political orientation and intelligence are correlated. Four of the haplogroups (E*, E3*, E3b1 and K*(xP)) show statistically significant differences between one or both of the control populations and some of the athlete groups. E*, E3* and K*(xP) are positively associated with aspects of endurance running, whereas E3b1 is negatively associated. Paragroups E* and E3* have a Sub-Saharan African distribution, and do not include the E3b clade which is also found outside Africa, or the E3a clade typical of Bantu speakers. Clade E3b1 which is negatively associated with endurance running is the main subclade of haplogroup E represented in Europe. Paragroup K*(xP) is likely of Eurasian origin. The authors go to some lengths to ensure that the differential representation of these haplogroups in endurance runners is not due to the fact that they are drawn from an ethnolinguistic subpopulation with different Y-chromosomal distributions. Thus, they propose that it may be the case that some genes on the Y chromosome may affect endurance running performance. Colin N. Moran et al. Abstract Favourable genetic endowment has been proposed as part of the explanation for the success of East African endurance athletes, but no evidence has yet been presented. The Y chromosome haplogroup distribution of elite Ethiopian athletes (n=62) was compared with that of the general Ethiopian population (n=95) and a control group from Arsi (a region producing a disproportionate number of athletes; n=85). Athletes belonged to three groups: marathon runners (M; n=23), 5–km to 10–km runners (5–10K; n=21) and other track and field athletes (TF; n=18). DNA was extracted from buccal swabs and haplogroups were assigned after the typing of binary markers in multiplexed minisequencing reactions. Frequency differences between groups were assessed by using contingency exact tests and showed that Y chromosome haplogroups are not distributed amongst elite Ethiopian endurance runners in the same proportions as in the general population, with statistically significant (P<0.05) differences being found in four of the individual haplogroups. The geographical origins and languages of the athletes and controls suggest that these differences are less likely to be a reflection of population structure and that Y chromosome haplogroups may play a significant role in determining Ethiopian endurance running success. One of the main arguments against the existence or importance of races is the observation that on average, 15% of genetic variation is between groups and 85% of variation is between individuals. Of course, subspecies of other primates often show comparable, or even lower variability than human races, therefore, there is no hard limit on the amount of genetic variation that merits subspecific recognition. Of course, the average amount of genetic variation is simply a per locus average. This hides two important dimensions of the problem: first, that genes don't have independent effects on phenotypes, which often have a polygenic mode of inheritance. If a number of different genes influence a particular phenotype, then small average differences in each of them may amount to a large overall difference. But, the fact that the average amount of ~15% is average means that individual loci themselves may exhibit a much higher degree of genetic differentiation, something which is not immediately apparent by considering the average. Whereas average FST values in worldwide human populations are ∼0.123 (Akey et al. 2002), seven and two SNPs in CYP3A4 and CYP3A5, respectively, had an FST >0.5 between African Americans and the non-Africans, reaching a maximum of 0.66. Note that unlike many ancestry informative polymorphisms which are defined in so-called "junk" DNA, such as e.g., markers defining Y-chromosomal or mtDNA haplogroups, the CYP3A5 locus has a functional importance, and as the authors observe, has undergone selection in non-African population, leading to the current pattern of strong differentiation. E. E. Thompson et al. Members of the cytochrome P450 3A subfamily catalyze the metabolism of endogenous substrates, environmental carcinogens, and clinically important exogenous compounds, such as prescription drugs and therapeutic agents. In particular, the CYP3A4 and CYP3A5 genes play an especially important role in pharmacogenetics, since they metabolize >50% of the drugs on the market. However, known genetic variants at these two loci are not sufficient to account for the observed phenotypic variability in drug response. We used a comparative genomics approach to identify conserved coding and noncoding regions at these genes and resequenced them in three ethnically diverse human populations. We show that remarkable interpopulation differences exist with regard to frequency spectrum and haplotype structure. The non-African samples are characterized by a marked excess of rare variants and the presence of a homogeneous group of long-range haplotypes at high frequency. The CYP3A5*1/*3 polymorphism, which is likely to influence salt and water retention and risk for salt-sensitive hypertension, was genotyped in >1,000 individuals from 52 worldwide population samples. The results reveal an unusual geographic pattern whereby the CYP3A5*3 frequency shows extreme variation across human populations and is significantly correlated with distance from the equator. Furthermore, we show that an unlinked variant, AGT M235T, previously implicated in hypertension and pre-eclampsia, exhibits a similar geographic distribution and is significantly correlated in frequency with CYP3A5*1/*3. Taken together, these results suggest that variants that influence salt homeostasis were the targets of a shared selective pressure that resulted from an environmental variable correlated with latitude. In modern industrialized societies degenerative diseases such as diabetes, cancer, Alzheimer's etc. have a much higher prevalence today than in the past, and a higher prevalence than in Third World societies. This development requires an explanation. One idea is that modern society allows individuals who have the diseases to survive and reproduce; therefore, the genes for these diseases are not culled by natural selection, unlike in primitive societies where the hardships of life allow only individuals with a healthy genetic predisposition to survive. In other words this is supposed to be evidence and consequence of genetic deterioration of populations. A proposed solution is eugenics, or genetic engineering to sanitize our genetic makeup. Another idea is that in modern societies individuals face physical and psychological stresses, e.g., large crowds, pollution, electromagnetic waves, etc. which cause disease, because we are maladapted to the environment we have created for ourselves. The rise in degenerative disease is seen as a consequence of evironmental deterioration. A proposed solution is to clean the environment, and make technologies more "natural". There can be no doubt that both effects may in fact explain (partly) the rise of degenerative disease. But, both of them fail to take a third factor into account, which I suspect may be more important than both. Even if there was no genetic deterioration or environmental deterioration, the rise of degenerative disease would still be seen in populations of modern societies. This is a simple consequence of the one reality of life, namely death. The total mortality of the population is always 100%, as we all eventually die. Therefore the prevalence of a particular disease (which brings us closer to death) does not depend exclusively on factors (genetic or environmental) that cause the disease. It also depends on other diseases or lethal factors which might beat them to the punch. In previous centuries for example, death during childbirth, tuberculosis, death in war, famine etc. were more prevalent. Thus, they took a larger part of the 100% pie. Degenerative diseases were thus correspondingly less important, because irrespective of genes or environments affecting them, we used to die of other causes. Therefore, we must pause whenever we hear alarming statements about the supposed disease-causing effects of genes or environments: if a concrete causative explanation is established between a genetic variant (e.g., sickle-cell trait) or environmental influence (e.g., smoking) then we must accept this explanation. But, when it is maintained that such genetic or environmental causes must exist due to temporal trends in disease prevalence then we must question the premise that genes or environments have anything to do with these trends at all, since such trends can occur even if genes or environments have nothing to do with the particular disease in question. Imagine a population where two alleles exist for one gene: allele A at a frequency of 90%, and allele B at a frequency of 10%. Allele B causes a disease which reduces individuals' genetic fitness by half. This disease can be treated by some substance, e.g., spinach, in which case normal fitness levels are attained. If B carriers are left untreated, then at the next generation the frequency will shift to 94.7% for A (=90/95) and 5.3% for B (=5/95), and in subsequent generations the frequency of B will continue to decrease until A is fixed in the population. Suppose that some regime (HARSH) uses a policy, in which everyone is given the same deal (=no spinach). Under this regime, the allele B will disappear as quickly as possible. We can say that HARSH practices a type of egalitarianism, as it treats everyone the same. A second regime (NAIVE) gives spinach to everyone. Assuming that spinach doesn't hurt normal (A carrying) individuals, then this will result in the frequencies of A and B remaining the same. This is also egalitarian, but it results in the opposite effect, the maintenance of the genetic status quo rather than the rapid disappearance of B as in the HARSH regime. Finally, a third regime (SMART) gives spinach only to B carriers. Again, B will be maintained at a frequency of 10%, but in this case the regime gave spinach to only 10% of the population, a much smaller cost than the NAIVE one. The policy of SMART is non-egalitarian, as B carriers got a special bonus. The above examples were hypothetical, but they correspond to real concrete policies carried out in the real world. As an example of a HARSH strategy, eugenicists were traditionally worried about how modern society's inventions were allowing for the survival of the "unfit", while in ages past natural selection weeded them out. On the other hand an example of a NAIVE strategy is the adoption in many countries of universal health care plans. These benefit mainly the poor members of society, since rich individuals are generally in better health and can afford to pay for health care on their own. Finally, a SMART strategy is applied often in medicine, where drugs are administered only if they are likely to improve a person's health. But, this is not always so, as medical organizations often make generalized diet and lifestyle recommendations addressed to all, even though they do not benefit all, and indeed might even harm some. All three strategies have the potential of misuse, and are thusoften met with resistance. For example, the HARSH strategy is inhumane, as it strikes us as fundamentally wrong to see a problem, know that there is a solution, and yet fail to apply it in the interest of "equality". Similarly, the NAIVE strategy is seen as wasteful, as resources are invested equally to all, even to those who do not need them. Finally, the SMART strategy has an element of preferential treatment which bothers our sense of justice. We might not care so much if the "spinach" corresponds to e.g., aspirin, but if it is expensive drugs or social programs, then we might oppose them. Human history is marked by the continuous invention of new "spinach", such as printed books, wheelchairs, eyeglasses, hearing aids, etc. that allow us to function despite our deficiencies. Societies try to balance concerns about equality, efficiency and justice while administering these means to its members. If there is an ideal state at the end of this historical process, we might imagine that this would entail mankind's mastery of essentially limitless resources, coupled with a deep understanding of human nature. This will allow it to apply the SMART strategy to those who need it, while at the same time the rest will not mind, as their own resources will not be affected by this preferential treatment. Mark Jobling has written Human Evolutionary Genetics, an important new textbook about the genetic origins and makeup of humans. You can read three chapters online at the publisher's site. As an example, Figure 1.5 illustrates the arbitrariness of different possible population groupings based upon DNA sequence diversity at an HLA locus. Often an objective way to choose between different interpretations is not obvious (though objective methods are discussed later in this book), and in its absence, simple assertion often fills the vacuum. Figure 1.5: Grouping populations – take your pick. Of course Arthur Kemp, White nationalist "historian" insists otherwise. Mitochondrial DNA (mtDNA) coding region polymorphisms, as well as the 150T polymorphism in the noncoding region, have been associated with longevity. We have studied here the association of 150T with longevity further and assessed differences in this association between various mtDNA haplogroups. We analysed a sample of 321 very old subjects and 489 middle-aged controls from Finland and Japan. 150T was more frequent among the very old than among the controls in both the Finnish and Japanese subjects. Interestingly, the association was not similar in all haplogroups, and a stratified analysis revealed that two additional common polymorphisms, 489C and 10398G, modified the association between 150T and longevity. These findings suggest that longevity is partly determined by epistatic interactions involving these three mtDNA loci. See also (from the 2003 survey) my previous posts on rates of homosexuality and favorite positions. While these surveys carried by condom maker Durex over the Internet have their shortcomings, they give some clues into global variation in sexual behavior. A new study investigates the idea of "Iberian exceptionalism", namely that countries founded by Iberians in the Americans have a lower or no racial prejudice. The authors discover that the opposite is true: Latin American countries show a higher degree of racial prejudice than the United States. The “racial democracy” (Iberian exceptionalism) thesis claims that racial prejudice in Latin America is not only lower than that found in the United States but is essentially absent altogether. We explored the plausibility of this thesis by the use of both explicit and implicit prejudice measures among Blacks and Whites from the United States and three Caribbean nations. In general, the results showed significant racial prejudice against Blacks and in favor of Whites in all four nations. African Americans were the only participants not to show significant implicit prejudice either in favor of or against Blacks. In addition, North Americans (i.e., participants from the United States) displayed lower implicit and explicit racial prejudice than participants in each of the three Latino nations. Overall, the results clearly contradicted the thesis of racial democracy and suggest that Latin America may not be nearly as egalitarian as some have argued. This cross-sectional study was carried out to investigate the frequency of consanguineous marriage in a group of army conscripts in Ankara and the factors affecting this. Of 4153 soldiers, 387 were married. The rate of marriage between first cousins was found to be 19·1%, and the overall rate of consanguineous marriage was 24·1%. Consanguineous marriage was found to be significantly prevalent among soldiers who were born in and still living in the Eastern region; among those who lived in villages; among those whose parents as well as themselves had low educational levels; and among those whose marriages were arranged by their families. Neither the payment of bride-price nor the presence of consanguinity between parents was a significant factor for consanguineous marriage. In addition, the age of the soldier and the age at marriage were significantly lower among soldiers married to first cousins than among soldiers whose marriages were not consanguineous. A review article is a convenient summary of current knowledge on European genetic diversity, with 204 references which will be useful to anyone interested in the subject. Besides its obvious intrinsic value, knowledge of population history, and of the demographic and evolutionary changes that accompany it, has proven fundamental to address applied research in human genetics. In this review we place current European genetic diversity in the context of the global human genome diversity and review the evidence supporting a recent African origin of the Europeans. We then discuss the results and the interpretation of genetic studies attempting to quantify the relative importance of various gene flow processes, both within Europe and from Asia into Europe, focusing especially on the initial, Paleolithic colonization of the continent, and on later, Paleolithic postglacial and Neolithic dispersals. Finally, we discuss how knowledge of the patterns of genetic diversity in Europe, and of their inferred generating processes, can be extremely useful in planning health care and in biomedical research. The police interrogation of Armenian Archbishop Nourhan Manougian, who allegedly slapped yeshiva student Zvi Rosenthal after Rosenthal spat at Manougian and at a crucifix during the Exaltation of the Holy Cross procession in the Old City this week, reveals a little bit of the increasingly wild Jewish-nationalist-religious atmosphere in Jerusalem. It is the bad luck of the Armenians, a peaceful and modest community in the city, that its churches and other institutions, including their ancient cemetery, is on the way to the Jewish Quarter in the Old City. As a result, the priests of the community suffer from the unrestrained behavior of yeshiva students who pass through the Armenian Quarter, sometimes deliberately, to do harm and cause strife. Interior Minister Avraham Poraz issued a strongly worded statement Tuesday against incidents of Jews spitting at Christian clergy in Jerusalem, saying he was "repulsed" by the repeated attacks." The clergyman prefered not to lodge a complaint with the police and told an acquaintance that he was used to being spat at by Jews. Many Jerusalem clergy have been subjected to abuse of this kind. For the most part, they ignore it but sometimes they cannot. On Sunday, a fracas developed when a yeshiva student spat at the cross being carried by the Armenian Archbishop during a procession near the Holy Sepulchre in the Old City. The archbishop's 17th-century cross was broken during the brawl and he slapped the yeshiva student. Both were questioned by police and the yeshiva student will be brought to trial. The Jerusalem District Court has meanwhile banned the student from approaching the Old City for 75 days. But the Armenians are far from satisfied by the police action and say this sort of thing has been going on for years. Archbishop Nourhan Manougian says he expects the education minister to say something. "When there is an attack against Jews anywhere in the world, the Israeli government is incensed, so why when our religion and pride are hurt, don't they take harsher measures?" he asks. According to Daniel Rossing, former adviser to the Religious Affairs Ministry on Christian affairs and director of a Jerusalem center for Christian-Jewish dialogue, there has been an increase in the number of such incidents recently, "as part of a general atmosphere of lack of tolerance in the country." Rossing says there are certain common characeristics from the point of view of time and location to the incidents. He points to the fact that there are more incidents in areas where Jews and Christians mingle, such as the Jewish and Armenian quarters of the Old City and the Jaffa Gate. There are an increased number at certain times of year, such as during the Purim holiday. "I know Christians who lock themselves indoors during the entire Purim holiday," he says. Former adviser to the mayor on Christian affairs, Shmuel Evyatar, describes the situation as "a huge disgrace." He says most of the instigators are yeshiva students studying in the Old City who view the Christian religion with disdain. "I'm sure the phenomenon would end as soon as rabbis and well-known educators denounce it. In practice, rabbis of yeshivas ignore or even encourage it," he says. Evyatar says he himself was spat at while walking with a Serbian bishop in the Jewish quarter, near his home. "A group of yeshiva students spat at us and their teacher just stood by and watched." Jerusalem municipal officials said they are aware of the problem but it has to be dealt with by the police. Shmuel Ben-Ruby, the police spokesman, said they had only two complaints from Christians in the past two years. He said that, in both cases, the culprits were caught and punished. He said the police deploy an inordinately high number of patrols and special technology in the Old City and its surroundings in an attempt to keep order. Jeet at Gene Expression links to a new study which discovers that female relatives of the mothers of male homosexuals produce more offspring. Thus a particular genetic predisposition manifests itself as homosexuality in a man and as increased fertility in a woman. Homosexuality is due to gene(s) which are (obviously) detrimental to a man's genetic fitness but are advantageous for his female relatives. This would agree with my recent idea that a person's sexual orientation is a combination of masculinity/femininity genetic factors inherited from his/her parents. Male homosexuals would thus tend to have more feminine parents. A more feminine mother would give birth to more children, both because she would be more attractive, and thus likely to be married early, but also because femininity is probably a good indication of a woman's reproductive health. If this intuition is correct, then in layman's terms, if your wife's female relatives have big families, then on the up side there's an increased chance that you have a beautiful and fertile wife, but on the down side there is an increased chance that your son will be gay. A new study investigates the occurrence of genetic recombination in humans. The authors used a large set of individuals and discovered that there is a correlation between a mother's age and maternal recombination counts in her offspring. There are two possible explanations for this: either a woman's eggs have a higher recombination rate as she ages, or an egg with high recombination rate has a higher chance of being fertilized and finally born. The authors reject the first hypothesis, as it makes some assumptions which have not been confirmed empirically, and conclude that eggs with higher recombination rates have a higher chance of being born. If this is true, then women whose eggs have higher recombination rates would produce more babies. After regressing family size on average recombination rate, this "selection hypothesis" is confirmed, even though the effect is modest, as many factors influence family size. Moreover, bylooking at sister pairs it is estimated that recombination rate has a heritability of ~30% in the group of women of this study. Therefore, it is likely that maternal recombination rate is a trait under positive selection. Intergenerational mixing of DNA through meiotic recombinations of homologous chromosomes during gametogenesis is a major event that generates diversity in the eukaryotic genome. We examined genome-wide microsatellite data for 23,066 individuals, providing information on recombination events of 14,140 maternal and paternal meioses each, and found a positive correlation between maternal recombination counts of an offspring and maternal age. We postulated that the recombination rate of eggs does not increase with maternal age, but that the apparent increase is the consequence of selection. Specifically, a high recombination count increased the chance of a gamete becoming a live birth, and this effect became more pronounced with advancing maternal age. Further support for this hypothesis came from our observation that mothers with high oocyte recombination rate tend to have more children. Hence, not only do recombinations have a role in evolution by yielding diverse combinations of gene variants for natural selection, but they are also under selection themselves. A new study shows that intelligence and body symmetry are correlated, and the correlation becomes more marked for intelligence tests with higher loading of the general intelligence factor g. This may indicate that both g and body symmetry are influenced by a general "fitness" factor. Mark D. Prokosch et al. Just as body symmetry reveals developmental stability at the morphological level, general intelligence may reveal developmental stability at the level of brain development and cognitive functioning. These two forms of developmental stability may overlap by tapping into a “general fitness factor.” If so, then intellectual tests with higher g-loadings should show higher correlations with a composite measure of body symmetry. We tested this prediction in 78 young males by measuring their left–right symmetry at 10 body points, and by administering five cognitive tests with diverse g-loadings. As predicted, we found a significant (z=3.64, p<0.003) relationship between each test's rank order g-loading and its body symmetry association. We also found a substantial correlation (r=0.39, p<0.01) between body symmetry and our most highly g-loaded test (Ravens Advanced Progressive Matrices). General intelligence is apparently a valid indicator of general developmental stability and heritable fitness, which may partly explain its social and sexual attractiveness. Are "ethnic genetic interests" behind ethnocentrism? A test. An omnipotent being presents itself before you, posing a simple dilemma: either George, an 18-year-old co-ethnic, or Michael, an 18-year-old foreigner will be killed. You are also told that (a) neither George or Michael are your close kin, and (b) that Michael is twice closer to you genetically than George. You can decide to spare either George or Michael. Who would you choose? If ethnocentric behavior arises from our desire to further our genetic interests, then we would choose to spare Michael. If it arises from our desire to support members of our ethnic group irrespective of genetic interests, then we would choose to spare George. I would personally choose to spare George. I suspect that this would be the case for at least most of my countrymen, that they would choose to spare a fellow Greek rather than e.g., Turk or Bulgarian who happened to be closer to them genetically. Even though condition (b) is an ideal case for the "genetic ethnocentrism" thesis (you are told the exact degree of relatedness of the individuals affected by our actions), I believe that it does not create nearly the same motivation to save Michael than the simple notion that "George is a Greek" does to save him. Condition (a) is very important to elicit the above choice. Imagine for example that you're an American of German ancestry fighting in WWII. If you're an ethnocentric German-American, then you will doubtlessly choose to kill a German to protect a fellow American, even though you're most likely closer kin to the German than to the American. But, if you knew that the German e.g., was your cousin, then you might be tempted to look the other way. I suspect the traits that make being a mother attractive are "feminine", such as taking pleasure in nurturing others. An ambitious woman with a aggressive personality is likely to choose to be a newspaper reporter (explaining partially why the writers or so feminist), but this choice is likely to go along with having fewer children. (Alas, high IQ makes a interesting career easier to achieve and leads to fewer offspring). Thus, I suspect there is already strong selection for femininity. A second argument is that success in the workplace in many cases depends on being attractive. Attractive, feminine women get more career breaks, hence they may be more likely to have decreased fitness. Not to mention that attractive people are often more intelligent, as both intelligence and attractiveness are partially depended on health which in turn depends on genetic factors. Lesbians on the other hand are (i) fewer than male homosexuals, and (ii) have a much easier option of having kids if they choose to. Hence increased lesbianism and increased male homosexuality do not balance each other out. This would affect the frequency of feminine phenotypes but would probably be counterbalanced by improved cosmetic technologies which are leading to a more efficient phenotypic feminization of women. As I have mentioned previously, I doubt that ethnocentrism is adaptive, i.e., that it is due to genetic factors and that it has evolved. In this post, I will discuss my views on the origin of ethnocentrism. But, before I get into that, I'll summarize the evidence which leads me to doubting a "genetically induced ethnocentrism." First, altruistic acts to co-ethnics are usually detrimental to one's genetic interests, because co-ethnics are much further removed genetically than your close kin. So, you can't afford to spend too much on them (in terms of fitness), and not only do you have to spend a little on them but you also need to benefit many of them to realize any benefit in terms of "inclusive fitness". Second, an argument from history: time and again peoples have allied themselves with alien peoples against their co-ethnics, e.g., in WWII, where the northern Europoid Germans allied with the southern Europoid Italians and Mongoloid Japanese against the northern Europoid Anglo-Americans and Slavs. Third, an argument from historical change, e.g., the transformation of Germans from ultra-ethnocentrics of c. 1940 to quite non-ethnocentric today, or of the Japanese from aggressive ethnocentrics to mild passive ones, or of the Americans who restricted immigration in the 1920s to the Americans who opened the gates of the USA to the Races of Mankind in the 1960s. Or, of the Jews who have have thousands of years of history transitioning between aggressive ethnocentrism, passive ethnocentrism, assimilationism/internationalism. Fourth, again from history, the evidence of so many irrational "last stands" where people have chosen to be anhilated (reducing their genetic fitness to 0) rather than be enslaved (thus maintaining some genetic fitness), i.e., ethnocentric behavior that does not make sense in terms of genetic fitness. Such arguments lead me to the conclusion that ethnocentrism is usually maladaptive, and thus cannot have possibly been selected for. But, this still leaves us with the experience of ethnocentrism. So, if ethnocentrism exists, and it is not adaptive, why does it exist? In my view, ethnocentrism is a learned behavior (cf. third argument above). No one is "born" to be ethnocentric. Everyone learns to be ethnocentric as part of the socialization process. To see why this is the case, consider the many millions of immigrants to the US (in the days before globalization and multiculturalism) who have happily shed one ethnic identity for another. Or, the Janissaries, tied by "shared genetic interests" with Greeks and Slavs, but fighting for the Muslim Ottoman genetic interests due to the fact that they learned a Muslim Ottoman ethnic identity. Or all those who have acquired an internationalist perspective due to travelling the world or being exposed to internationalist ideology. It must be emphasized that ethnocentrism is impossible without an ethnic identity. And an ethnic identity is socially constructed; no one is born with a knowledge or tendency of being e.g., German. You become a member of an ethnic group. Note that this has nothing to do with choosing your ethnic group; it simply states that we don't have hard-wired ethnicities. Imagine that Bosnian Muslim and Christian children are abducted and raised in a far away land where they are told that they are part of the same group. Clearly, there would be no ethnocentrism in this example, as their ethnic identities are non-genetic in origin. Now, imagine that in a Catholic nation, a new sect appears which opposes Catholicism [you don't actually have to imagine this if you know something about the Reformation]. Members of this sect start aggregating in new places of worship and adopt various new cultural traits distinguishing them from the Catholics. Again, the two groups are not genetically different, although with continued separation they may eventually become so. But still, members of the two groups will become ethnocentric, supporting members of the in-group. Then, imagine that Japanese and White Californian children are brought up by ethnocentric leaders, which teach them to dislike white and mongoloid people respectively. Or, conversely imagine a time machine transporting young would-be kamikaze from Imperial Japan into 21st century California and raising them as "Americans". These examples clearly illustrate that ethnicity and its attendant ethnocentrism are learned behaviors. Often they are rationalized in terms of genetic factors (i.e., "blood") but they are not inherently genetic. The ethnicity meme  is of course successful, as nearly all living humans are part of an ethnic group and have various degrees of ethnocentrism. There is need for an explanation for its success. I have no doubt that the origin of the ethnicity meme must be sought in kinship groups. Proto-ethnic groups were nothing more than kinship groups consisting of a few families. In that sense their ethnocentrism would make sense in terms of kin selection, due to the high relatedness coeffciient between their members. The origin of ethnic groups in kinship groups explains much of the language of ethnicity (e.g., fatherland, brothers, etc. ), but it would be a mistake to think that ethnic groups are maintained by extended family ties. The origin of proper "large" ethnic groups must be sought in the Neolithic period, when the aggregation of tribes into larger units based on systems of trade and exchange and complex political organization first become possible. These new ethnic groups were no longer homogeneous, as they consisted of unrelated tribes which had adopted common cultural elements, spoke the same language or recognized the same "king'. These groups were no longer genetically homogeneous, at least not enough for kin nepotism to justify most altruistic acts in favor of co-ethnics. On the other hand, their existence was profitable to both their members (since civilization depends on large numbers) and to their rulers. For this reason, large ethnic groups were successful. The ethnicity meme was cemented by two forces: the psychological profit of belonging in a large, or illustrious group, and the fear of "not-belonging" or "rejection from the tribe" which feeds on the universal human need for social contact. Both these psychological mechanisms are self-evident and they express perfectly the historical record of ethnocentrism, unlike genetic rationalizations for the same phenomena. For example, the Hellenic ethnicity spread, according to Thucydides at least, as different "tribes" associated themselves with "Hellen and his sons". Clearly, the Proto-Hellenic ethnic group's prestige was what led to many people being added to its ranks, and this process continued into historical times. Or, we may look at the spread of the Roman ethnicity, which spread from a small Italian town to the point where millions around the Mediterranean considered themselves to be Roman. More recently, we see the expansion of the Magyars in Hungary, a relatively minor element growing in numbers due to its prestige as conquerors of Pannonia. But, the opposite phenomenon is also seen, e.g., the anhilation of Celtic ethnicity after the Romans conquered the Gauls, or of (almost) all ethnicities of Asia Minor when Alexander conquered Asia. Ethnicity is also maintained by fear, e.g., the fear of shame which led the Spartans to death rather to defeat, or the Souliotes over the cliff. It is the same fear which ensures that young men will always be ready to die for their country , since the opposite would bring shame. Ethnocentrism is the attitude of aiding one's ethnic group even at personal expense. While this sometimes increases a person's inclusive fitness, it most often does not. Therefore, ethnocentrism is generally not an adaptive trait, and hence cannot have evolved. Instead, it is proposed that ethnocentrism is dependent on the creation of an ethnic identity, and ethnic identity emerges from the need of small tribes and individuals to join forces for mutual benefit, and from the desire of rulers to control many individuals and to extend their power. However, this still leaves the question open on why ethnocentrism is such a popular cultural element, and it is proposed that it persists because it serves a psychological need (a feeling of power and belonging), while its dissolution is tagged with costs of rejection and shame. I don't particularly like the idea of "memes", but in this case it fits quite well the origin and development of ethnic identities,. Of course when ethnic identity is eroded, as in e.g., the USA, most young men are not ready to die for their country. On the heels of a previous study which proposed that better nutrition of the less privileged is responsible for increases in mean IQ, a new study proposes that the education system has played this role. This paper proposes one potential explanation for 100 years of rising population mean IQ in the United States associated with historical changes in access to schooling and educational practice. A neurodevelopmental-schooling hypothesis is forwarded based on evidence of growth in the population's access to schooling early in the last century and the increasing cognitive demands of mathematical curricula from mid-century onward. The fact that these educational changes have been widespread, affect individuals early in the lifespan, and are uncorrelated with genetic propensity for IQ makes them particularly well suited to produce large environmentally driven gains in intelligence between generations in the face of high heritability for intelligence. Future directions for research that would test the neurodevelopment-schooling hypothesis are described. Hamilton's Rule states that altruistic behavior is adaptive when the inequality rB-C>0 holds. Equivalently, an altruistic behavior is adaptive if its cost is C<rB. Since r between co-ethnics is low, most altruistic behavior towards them is non-adaptive; or as I stated informally, it is the few "dramatic actions" which are only adaptive. Sure, it's better to do an altruistic act for a co-ethnic than a foreigner. But it's better in the sense that you lose less if you help a co-ethnic than a foreigner. Your genes don't gain anything in either case. Altruism is adaptive for your close kin. Altruism for your co-ethnics or foreigners is (usually) a strictly lose or lose-more proposition. Hair acts like a frame, emphasizing facial features. Light hair "softens" features, while dark hair makes them more prominent, just as a frame draws attention to the painting. Women with "hard" features have a higher reproductive fitness if they are blond, since they look more feminine, due to the above-mentioned softening effect. Hence, there is sexual selection in favor of light hair which however operates primarily on facially robust and un-feminine populations. This selection allows the robust and un-feminine characteristics to persist if they are linked with light hair; by contrast, in a brunet population, sexual selection operates on facial characteristics alone, leading to a swifter selection for facial beauty. Superior beauty is primarily a function of facial features, and since (i) good facial features are enhanced by framing, and (ii) brunet populations evolve towards a more attractive facial structure faster, it follows that brunettes are on average more attractive than blondes facially. Of course, I personally accept the last point of the above list, but it is possible that I might be biased. I had previously discovered a BBC Story which seemed to confirm my opinion. It was thus pleasantly surprising to see that this preference for dark hair is nothing new, but was noticed almost a century ago, and indeed by Havelock Ellis, whose escapade in the National Portrait Gallery was intended to show the alleged "superiority" of blonds. Artificially change the pigmentation of women photos, and determine whether attractiveness ratings improve when unattractive brunettes are given light hair and deteriorate when unattractive blondes are given dark hair, and that no or the opposite effect occurs from attractive women of either color. Compare random samples of blondes from a naturally blond population (e.g., from Sweden) with a random sample of brunettes from a naturally brunet one (e.g., from Spain) after removing the differences in hair color. I have written elsewhere on Arthur Kemp's against his misuse of genetic studies to "prove" the supposed significant African admixture in the Greek population. Recently, Racial Reality created an informative article on the same topic. Even though we should be cautious about generalizations based on single-locus studies, a recent article examining the HLA-DRB1 locus has shown that Greeks and "Macedonians", as well as other Balkan populations all cluster together and are separate from Africans, pace Kemp. Abstract: The Macedonian population is of special interest for HLA anthropological study in the light of unanswered questions regarding its origin and relationship with other populations, especially the neighbouring Balkanians. Two studies have been performed to examine HLA molecular polymorphism in the Macedonian population, so far. The present study is the first to be performed in Macedonia using high-resolution sequence-based method for direct HLA typing. The study included 158 unrelated healthy volunteers of Macedonian origin and nationality, having a Christian Orthodox religion. After the simultaneous amplification of exon-2 on both HLA-DRB1 alleles, DNA sequencing was used for genotype assignment. In the 158 samples analysed, all 316 alleles were typed and a total of 29 different DRB1 alleles were detected, with DRB1*1601 being the most frequent allele (14.9%), followed by DRB1*1104 (13.9%). A phylogenetic tree constructed on the basis of the high-resolution data deriving from other populations revealed the clustering of Macedonians together with other Balkan populations (Greeks, Croats, Turks and Romanians) and Sardinians, close to another "European" cluster consisting of the Italian, French, Danish, Polish and Spanish populations. The included African populations grouped on the opposite side of the tree. It is famed as a critical moment in code-breaking history. Using a piece of basalt carved with runes and words, scholars broke the secret of hieroglyphs, the written 'language' of the ancient Egyptians. A baffling, opaque language had been made comprehensible, and the secrets of one of the world's greatest civilisations revealed - thanks to the Rosetta Stone and the analytic prowess of 18th and 19th century European scholars. But now the supremacy of Western thinking has been challenged by a London researcher who claims that hieroglyphs had been decoded hundreds of years earlier - by an Arabic alchemist, Abu Bakr Ahmad Ibn Wahshiyah. Many peoples around the world have origin stories regarding their common ancestors. It is now possible to determine whether these stories have a basis in reality, or whether they are simply common myths. A new study tries to answer this question for several ethnic groups from Uzbekistan. As the authors point out, these are very conservative, previously nomadic, patrilineal groups with elaborate genealogies going up to 60 generations. By studying their Y-chromosomes the authors examine whether or not they share an ancestor at the various kinship levels recognized by them: lineage, clan and tribe. It is shown that lineages do in fact have common ancestors, whereas tribal ancestors are largely mythological. Thus, tribes may be formed by the coming together of various clans who invent a mythological ancestor to justify their union. Traditional societies are often organized into descent groups called "lineages," "clans," and "tribes." Each of these descent groups claims to have a common ancestor, and this ancestry distinguishes the group's members from the rest of the population. To test the hypothesis of common ancestry within these groups, we compared ethnological and genetic data from five Central Asian populations. We show that, although people from the same lineage and clan share generally a recent common ancestor, no such common ancestry is observed at the tribal level. Thus, a tribe might be a conglomerate of clans who subsequently invented a mythical ancestor to strengthen group unity. Many new mtDNA studies including the previously posted one on mtDNA haplogroup H are based on complete sequencing of mtDNA, allowing for a very detailed phylogenetic study of the populations examined. This is much easier for mtDNA compared to chromosomal DNA, since the former is much shorter. Studies based on complete sequencing typically have to use small samples, but the resulting phylogenetic knowledge can then be applied to larger population samples, by testing only the informative polymorphic loci discovered. A new study examines Indian mtDNA in this manner, and especially the macrohaplogroup N, which reaches its highest frequencies in Caucasoid populations, although its specific subclades are found in non-Caucasoids, e.g., Australoids. Most Indian matrilineages belong to a different maclohaprogroup, M, which is shared with the Mongoloids, although Indians harbor clades different from those of Mongoloids, indicating that they are both descended from ancient "Proto-Asian" populations. Both M and N predate the emergence of the modern racial divisions of mankind. Macrohaplogroup N is shared between Indians and West Eurasians but as this new paper indicates, in India it contains clades likely to be the result of admixture with West Eurasians, but also more ancient clades lacking in West Eurasia; these latter ones are indigenous to India, representing its earliest colonization. Malliya gounder Palanichamy et al. To resolve the phylogeny of the autochthonous mitochondrial DNA (mtDNA) haplogroups of India and determine the relationship between the Indian and western Eurasian mtDNA pools more precisely, a diverse subset of 75 macrohaplogroup N lineages was chosen for complete sequencing from a collection of >800 control-region sequences sampled across India. We identified five new autochthonous haplogroups (R7, R8, R30, R31, and N5) and fully characterized the autochthonous haplogroups (R5, R6, N1d, U2a, U2b, and U2c) that were previously described only by first hypervariable segment (HVS-I) sequencing and coding-region restriction-fragment–length polymorphism analysis. Our findings demonstrate that the Indian mtDNA pool, even when restricted to macrohaplogroup N, harbors at least as many deepest-branching lineages as the western Eurasian mtDNA pool. Moreover, the distribution of the earliest branches within haplogroups M, N, and R across Eurasia and Oceania provides additional evidence for a three-founder-mtDNA scenario and a single migration route out of Africa. First, Richard Dawkins wrote an article on race. Then Steve Sailer commented on it. Jason Malloy of Gene Expression replied, critiquing Sailer's assessment of Dawkins. And then, the discussion started. Much of the discussion revolves around an article by Frank Salter, which proposes that we are as related to our co-ethnics (relative to mankind) as we are to our cousins relative to our co-ethnics. In other words, Frank Salter proposes a genetic basis for ethnic nepotism. The analogy between the degree of relatedness between a person and their cousin (against an ethnic group genetic background) and a person and members of their ethnic groups (against the genetic background of the species) is accurate, but potentially misleading. To see why this is the case, imagine that each person has a $-value depending on how close they are genetically to us. Let's say that the average human has a value of $1, the average member of our ethnic group has a value of $10, and our cousin has a value of $100. So, our cousin is "more valuable" to us (relative to our co-ethnics) and our co-ethnics are "more valuable" to us (relative to our co-humans). But, we share many more polymorphisms with our cousin than we do with our co-ethnics than we do with our co-humans. So, in relative terms the analogy of me-cousin-coethnic with me-coethnic-cohuman is equivalent (ratio of 1:10), but in absolute terms, i.e., the number of my alleles in polymorphic loci, I am getting a $90 profit by preferring my cousin over my coethnic, whereas I get a $9 profit by preferring my coethnic over my cohuman. Genetic ethnic nepotism predisposition (if it exists) is a much weaker force than kin nepotism predisposition. Now, suppose that there is an "ethnic nepotism" allele, a genetic predisposition to get into trouble for persons of our ethnic group. Is it plausible that such an allele would be adaptive, especially for race-level groups? The answer is probably no, due to the fact that the set of different "actions" which would increase such an allele's prevalence is limited. It's only the more "dramatic" actions that benefit many of my coethnics at my expense that would have this effect, but the opportunity for such actions is rare, both because dramatic acts are rare in themselves, and also because for the greater part of human prehistory and history human groups had limited interaction with other racial groups. The Culture Ministry has given the go-ahead for a seismological study that might help provide a scientific answer to one of the most tantalizing questions of Greek archaeology: What caused the collapse of the flourishing Minoan culture on Crete some 3,500 years ago? A Russian expedition headed by a member of the Russian Academy of Natural Sciences Yuri Zakharov has established the exact location of the capital of the ancient state of Shambala – the mystical center revered by many religions and philosophers all over the World.